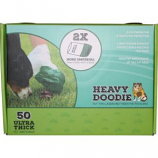 • Completely Biodegradable, Come In A Convenient, One At A Time Dispenser Box and Are Extremely Easy To Use. • Heavily Scented With A Baby Powder Fragrance To Mask Odor. 2-ply design for ultimate poo protection. Large storage capacity for big dogs and multiple poo piles. 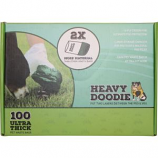 Each pet waste bag is 13 tall x 9 wide. . .